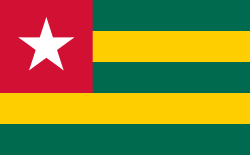 The flag of Togo was created in April 1960. It has five equal horizontal bands of green (top and bottom) alternating with yellow. There is a white five-pointed star on a red square in the upper hoist-side corner. This page was last changed on 13 January 2018, at 22:28.